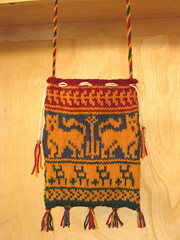 Here’s my second medieval pouch. This took a while because I haven’t been working on it very often. I got the majority of it done while I was at the Legislative District caucuses a few weeks ago (for 14 hours… don’t get me started on that. I didn’t knit the whole time I was there or I might have actually finished it all that day!). Cord and tassels: DMC perle cotton. Cords are twisted plied cord because I haven’t yet gotten around to learning fingerloop braiding. Chart: Refined version of my own earlier chart, based on motifs from period knitting in Rutt’s History of Hand Knitting, and also inspired by charts created by Dame Christian de Holacombe, found here. I used Excel to draw out the chart. I encourage anyone interested in a project like this to try it. It is very easy. 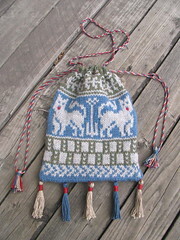 It looks much harder to knit one of these than it really is. Now, no more pouches for a while, I hope. 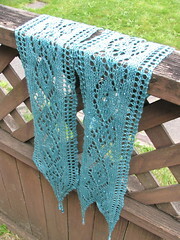 Recently I had an opportunity to design a knitting pattern using Brooklyn Handspun sock yarn. I had been kicking around the idea of designing a beaded lace scarf for a while, and was planning to use some pink Spritely Goods yarn in my stash. 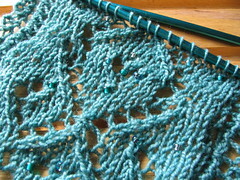 But creating the pattern for Brooklyn Handspun sounded like fun. I’ll do something else with the Spritely Goods. During my projects lately, I generally put periodic updates on my Ravelry page for the project so as not to clutter up the blog, but I thought it would be interesting to post about the process of designing this pattern. Well, it would have been nice if I’d finished this on Pi Day, because it’s from a pattern called “Kitty Pi,” but at least I finished it in March. 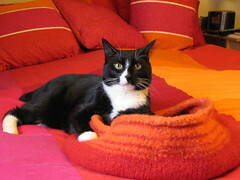 This is a bed for our cats. 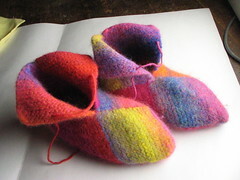 It’s felted, and knitted from Brown Sheep Lamb’s Pride Bulky, with size US11 needles. I used two skeins of Ruby Red and one of Orange You Glad, and have a little bit left of each color. I also used some Target Fuzzy Fur around the edge, but guess what? It doesn’t even show in the final felted item. So it was useless. Oh well. This cute sundress was designed for my niece’s birthday last year. 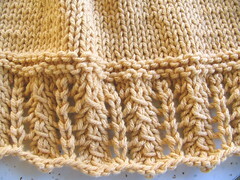 It’s very easy to knit, with a deceptively simple lace hem and a seed stitch bodice, and knits up really quickly. 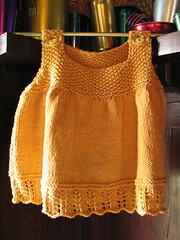 The pattern contains 3 sizes: 6mo, 1yr, and 2yr. 414-500 yards of worsted or aran weight yarn. The yarn called for is Lion-Brand Cotton-Ease, which is a cotton-acrylic blend that is soft, nice to work with, and easily found in your local craft store. I used just a little more than 2 skeins. 18 stitches/4 inches in stockinette stitch. Basic knitting; this is a good beginner lace project. The photos of the adorable baby modeling the dress were taken by Peter Backman. The dress she is wearing was knitted by Beth Ingersoll. (The other dress was knitted by me.) Thanks! Becca used my Detlef-13 felted laptop sleeve pattern to make a laptop sleeve with Zelda hearts. Very cool idea. I love how the last heart is half-empty; I guess that had to be done, otherwise they’d just look like normal hearts. Lots of old game graphics lend themselves quite well to the pixelly quality of multicolor knitting. Perhaps I’ll create some game-related charts that I can include with the Detlef-13 pattern. This is a prototype of sorts. Inspired mostly by the medieval cushions and relic pouches in Rutt’s A History of Hand Knitting , and a little bit by the recent cover story on medieval knitting in Tournaments Illuminated (it’s not online, but you can see virtually the same article here), I drew up a chart in a spreadsheet to play around with some heraldic motifs. I used some Wool-Ease I had sitting around; not exactly a period fiber, but good enough for experimenting. And the colors I had are quite nice. The chart includes some basic decorative motifs at the top and bottom (actual medieval patterns), some repeating ladders (my SCA badge is a ladder vert, bendwise, which means a green ladder, leaning with the top to the upper left), two cats in a medieval heraldic style (I suppose they look more like dogs, though), and some Ys, or shakeforks (a motif related to the Shire of Wyewood, the local group where I participate). However, once I started knitting, I saw that my stitches are much squarer than I expected, so the pouch’s proportions were going to be off. I ended up removing a rung of the ladders, and leaving the Ys out completely. Darn it. I will probably add a lining to this (it needs it because of the stranded wool inside), and redo the tassels because I don’t like them. 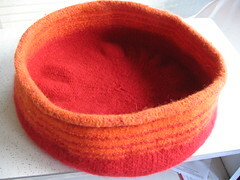 Then I will improve the design a bit and make one with 100% wool. 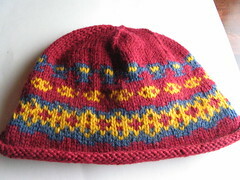 This was a fun project because it knit up very quickly, and every round you knit makes it look different. There’s also nothing very difficult about it. Just knit a tube and sew up the bottom, really. One for the knitters — check out this excellent chart of the colors you get from dyeing yarn with Kool-Aid. I have tried this before, using the Jamaica flavor to overdye a scarf. It works very well and is a lot of fun. It’s a little unpredictable, but worth experimenting with. Recently I was looking through the book For The Love of Knitting , which includes many pictures of vintage knitting patterns and books, and I noticed that one of the illustrations was of a Fleisher yarn company ad from 1921. The ad included a complete pattern for a very cute drop-stitch sweater, which it claims takes “less than two days’ time”! Now, here’s the neat thing — anything published pre-1923 is in the public domain in the United States. So this ad and the knitting pattern it contains are in the public domain (probably why the book included it). So I’m reprinting the 1921 pattern here for anyone who is interested. More photos and the pattern text after the jump! I promise some non-knitting content soon, seriously. Anyway. Even the designs that don’t work for me (and there are some that don’t — Labyrinth, for example) are all fascinating and inspiring in their creativity. 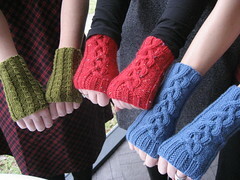 I immediately put the Linked Rib into my Ravelry queue, and ordered the required yarn from a Ravelry member. But while waiting to get started, I had a thought.